Two ports with different outputs in a slim form factor. Spigen is mostly known for its line of thin cases for phones, but the company has a suite of phone accessories. 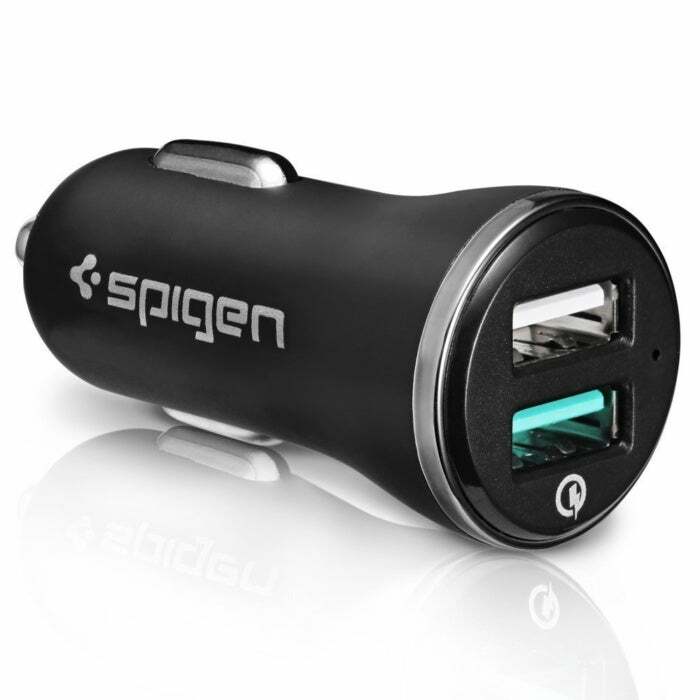 One such product is the Spigen Quick Charge 3.0 car charger ($10 on Amazon). Note: This review is part of our roundup of USB car chargers. Go there for details on how we tested this device. The front of the unit has two ports. One has a green highlight to it, the other is white. The green port is QC3.0 compatible, while the white port is a standard 5V/2A port. As with competing products, the Spigen’s ports are lit up, ever so slightly, making it easier to tell the ports apart and locate them in a dark car. In tests, the standard port charged an iPhone X and Galaxy S8 at 5V/1.4A, just below the advertised speed of 5V/2A. With the QC3.0 port, our test Galaxy S8 displayed Fast Charging once it was connected, with a rate of 9V/1.2A. Design-wise, the Spigen Quick Charge 3.0 car charger doesn’t stick far out of the power adapter in a vehicle, but it’s not quite flush either. Bottom line: At $10, the Spigen Quick Charge 3.0 car charger is a good deal for those who only have one QC3.0 device, and isn’t an eyesore. This inexpensive charger offers QC3.0 in one of its ports and a low-profile design.